This is a quick step-by-step walkthrough for authenticating a support phone call via the 34SP.com Control Panel. If you contact our technical support team via phone, they may ask you to authenticate your call. The phone call authentication process is a security procedure, designed to increase the security of you account information. 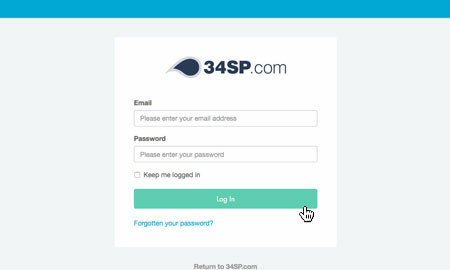 Please note: If you have received an authentication request without speaking to a member of 34SP.com staff on the phone, please contact our technical support team immediately as your account security may be at risk. 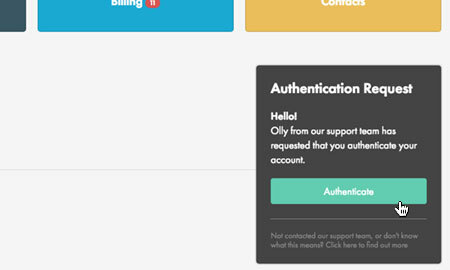 When you are speaking with a support technician, they will initiate an authentication request. You'll then be prompted to respond to this request via the 34SP.com Control Panel. To authenticate your account, simply click the green button labelled authenticate.